Oscar Pistorius is a ''paradox'' whose past triumphs as a sprinter crossing the finish line with raised arms contrasted sharply with the daily, severe limitations that he endured because of his disability, a physician testified Thursday at the runner's murder trial. 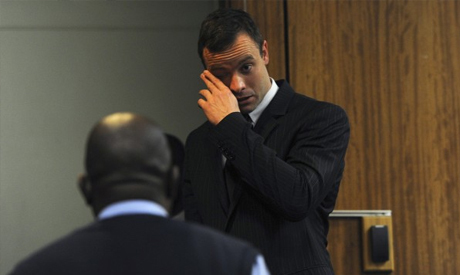 Wayne Derman, a professor of sport and exercise medicine at the University of Cape Town, said in court that the contrast likely contributed to stress and anxiety for Pistorius, who fatally shot girlfriend Reeva Steenkamp through a closed toilet door in his home. He testified for the defense, which wants to show that the athlete had a deep sense of vulnerability and it was a factor in what he has described as a mistaken shooting. ''You've got a paradox of an individual who is supremely able, and you've got an individual who is significantly disabled,'' said Derman, who has worked with South African Olympic and Paralympic teams and has treated Pistorius over half a dozen years. He noted that Pistorius' anxieties included concern about flying. ''He has a specific fear of being trapped somewhere without being able to move very rapidly,'' Derman said. Referring to Pistorius' decision to confront a perceived threat on the night he killed Steenkamp, Derman said ''fleeing was not an option'' because the runner has no lower legs. Pistorius, 27, says he killed Steenkamp on Feb. 14, 2013 by mistake, thinking there was a dangerous intruder in his home. He shot her while on his stumps. The prosecution says he intentionally killed the 29-year-old model after the couple had a Valentine's Day argument. Pistorius, who is free on bail, faces 25 years to life in prison if found guilty of premeditated murder, but he could also be sentenced to a shorter prison term if convicted of murder without premeditation or negligent killing. Additionally, he faces separate gun-related charges. During cross-examination, prosecutor Gerrie Nel said Derman, the physician, was giving ''character evidence'' rather than ''expert evidence'' and questioned whether the witness was capable of giving testimony that would work against Pistorius' defense. ''The truth would come before my patient,'' Derman said.